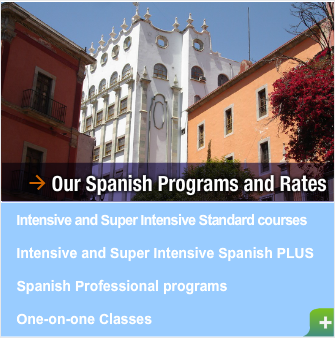 These programs are perfect for students that need to learn Spanish or perfect their Spanish in a short period of time. The classes include one-on-one private tutoring sessions and group classes, which will allow the student and teacher to focus on particular areas that the student finds to be the most challenging. The added advantage with the Intensive Plus and Super Intensive PLUS programs is that the student will receive additional one-on-one classes tailored to their specific needs. Students may enroll for as many weeks as they like. The focus here is the same as in our standard course. We will work on communication, listening, conversation, grammar, vocabulary, reading, and pronunciation skills. Rates: US$175 per week; Inscription fee: US$35. Rates: US$225 per week; Inscription fee: US$35. Rates: US$275 per week; Inscription fee: US$35. These courses are for those that only have a specific time frame to learn Spanish and need to perfect certain parts of the language. For example, if you are moving to another country or starting a new job and need to learn certain aspects of the language that relate to those areas, these courses are for you! The Immersion PLUS program is the most intensive form of instruction a student can receive at Plateros. The Immersion PLUS program consists solely of private one-on-one classes, which will allow the students and teacher to focus on particular areas that the student finds to be the most challenging; and includes a daily lunch with your teacher at nearby restaurants. Rates: US$525 per week; Inscription fee: US$35. Rates: US$655 per week; Inscription fee: US$35. Rates: US$805 per week; Inscription fee: US$35. 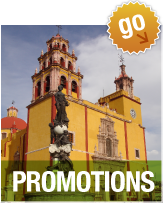 This program is designed for those individuals who would like to travel though Mexico or prepare for a trip while they are staying in Guanajuato, and speak little to no Spanish. Lessons are available by group or in private one-on-one sessions. You will learn the proper language structures that will help you to communicate with native Spanish speakers. The vocabulary is adapted to your needs and will help you to become more comfortable as you travel throughout a Spanish speaking country (means of transportation, menu items, and hotels). We will familiarize you with the customs and traditions of Mexico and prepare you for your trip. Rates: US$200 per week; Inscription fee: US$35. This program is designed for mature people who seek to combine their Spanish course with a great leisure program special for them. Rates: US$185 per week; Inscription fee: US$35. Rates: US$125 per week; Inscription fee: US$35. Rates: US$150 per week; Inscription fee: US35$.